This week, my family has enjoyed hosting relatives who are visiting from lands far, far away. From Florida and Ohio, to be exact. We did some big touristy things in the first few days which were lots of fun, but when it came to knowing my local vicinity, I fell short of being the best tour guide. A few minutes on the internet acquainted me with some of the offerings of our small town and immediate area, and tomorrow we’re off to see a giant sequoia grove which I had no idea was a mere 45 miles away. The smaller, less traveled roads will turn out to be just as memorable to us, and maybe more so. I think the same is true of setting in fiction. Big, exotic locales are not always necessary to capture a reader’s interest. As long as the location is believable and fully established, it will play into the plot and lend authenticity to the story. Sometimes the setting is the story. With that said, I consider my own immediate locale and the possibilities. What am I missing that would tell a great story in this place where I live and breathe and work? ‘Write what you know’ can become ‘write where you know.’ I’ve seen my town in all its seasons, in calamity and near-disasters, through record-setting heat, unexpected snowfalls and scorching fires. The people lean a certain way and they still say ‘Merry Christmas.’ They’re not afraid of challenge. It’s not known as ‘The Endurance Capitol’ for nothing. I need to haunt the museums and seek out the people who’ve kept record of life here for the past hundred years. I need to sit in on a few city council meetings to get the flavor of the movers and the shakers, gather brochures from the visitor’s center and discover what I’ve missed. I need to peel back the layers of my limited experience in these square miles and find the story worth telling. Who better than someone who has lived here for the past sixteen years? How about you? Have you considered where you live and breathe and work to have story potential or do you always look for a setting where the grass is greener? 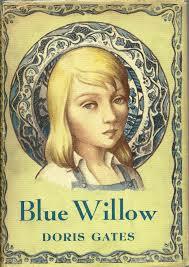 Debbie, I loved Blue Willow, but I didn't read it until I was a teacher determined to read all the Newberry Award winners. I love stories with a strong sense of place. All of my books are set where I live in Colorado. My next book, and I'm getting a little wild here, is set in the small beach town where I grew up. I know the pattern of the fog, and the rhythm of the trains, and the pull of the currents. I'm very uncomfortable writing stories of places I don't know. I've made one trip to San Clemente to refresh my memory. I wouldn't mind a couple more. Soon. When I read a book I usually (without really thinking about what I am doing) impose a picture of a place I already know. This probably changes the story from the one the author intended, but that's what happens when I read. Patti, what a great setting and perfect excuse to hang out at the beach. Is it still as small? Marian, I think we need a visual to hang the story on when we're reading. I'll bet you're in good company. I would love to write a book set in the beauty of NC but since I write about people from Biblical times, that probably isn't going to happen. Good thing I enjoy research! 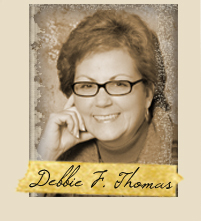 Debbie, I love this post. You make a wonderful point about the importance of setting to a story, and the validity of writing "where you know." My own writing has evolved over the years to where I now do exactly that ... write where I know. And I've experienced what it means to readers to read about places they know. Martina, the story gave me an appreciation for the plates, also. They certainly tell a story. Sharon, you have a choice of a lot of places you know. Lucky! I agree with you to the extent that I did 3 blog posts on LOCALE AS SETTING. I love a well-crafted setting and that's why certain books remain timeless, as setting has been delivered so truthfully we never forget it. Thanks, Denise, I'll check it out. Thanks for stopping by.